World of Illusion Sega Genesis Game cartridge Cleaned, Tested, and Guaranteed to work! This is by far my favorite Sega Genesis title. 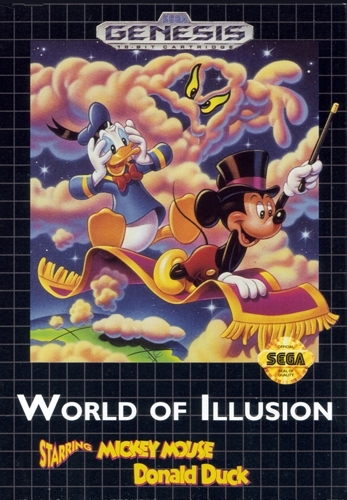 I'd even go as far to say that its superior to its predecessor, Castle of Illusion. 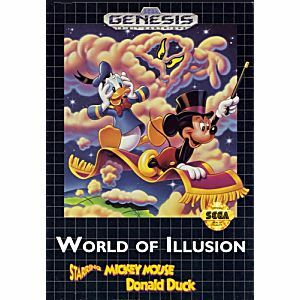 The game is basically three in one, with different experiences based upon character selection (Mickey or Donald) and multiplayer mode. The level design is fantastic, the difficulty is low but very enjoyable, and the animations are brilliant. The enemy sprites are pulled out of the popular Disney films and then given a sinister twist. I highly recommend.